Results-based carbon financing shows the way forward for involving the private sector in development, says ClimateCare’s Edward Hanrahan. There is increasing acknowledgement that the public and private sectors need to work together to build a sustainable future. In a world where 780 million people still lack access to safe drinking water , and cooking on open fires remains a leading cause of death in the developing world, the two sectors can agree on the objectives. But they often have different ways of working — and that can be a challenge. ClimateCare, the organisation I lead, has the commercial experience and social vision to act as translator, facilitator and implementation partner for both businesses and governments looking to meet environmental and social development targets. In particular, the field of carbon financing has shown that a results-based payment model can unlock funding from the private sector to complement public sector aid and development budgets. Businesses are increasingly looking to fund projects that address their environmental impacts (predominantly water use and carbon emissions) and improve the communities in which they work or intend to move into. For most this is not just philanthropy — it is pragmatic planning that calls for clear, measurable outcomes and defined business benefits. Over 15 years, ClimateCare has worked with blue-chip companies which, having taken steps to reduce carbon emissions, want to address their remaining ‘footprint’ by funding external emissions reduction projects. The way that carbon financing works is by companies funding projects that cut emissions — but the projects usually receive payments only when carbon dioxide reductions have actually been delivered. ClimateCare has helped the private sector fund more than 50 low-carbon development projects, distributing safe water to nearly six million people and clean cookstoves to more than 750,000 families. For example, in Uganda, carbon finance has helped build local manufacturing for clean cookstoves, creating jobs, cutting carbon emissions and reducing pressure on local forests that are harvested for fuel. These stoves use 36 per cent less fuel than traditional cooking methods, helping families save money on fuel and cut indoor air pollution. Integration is a key part of our approach — helping large corporates to focus their environmental and social impact activity on projects that deliver on multiple fronts in climate and development. And increasingly, we find ourselves the facilitator in relationships between international business and its NGO and government partners. This results-based approach to carbon financing is one that businesses are familiar and comfortable with. But like many others, we have been working to develop a similar mechanism that unlocks payments for the development outcomes of projects, such as health improvements or provision of safe water. This is no easy task. The first challenge is how to measure and verify development outcomes. Back in 1997 we faced a similar challenge in the emerging market for carbon credits. A reduction in carbon emissions was difficult to attribute to a single project, and could perhaps have happened without the intervention. To counter this, ClimateCare is one of the organisations that has contributed to the development of methodologies for internationally accepted standards, such as the Gold Standard (a certification standard for carbon mitigation projects). Through this work we helped make it possible to finance safe water and clean cookstove projects through the sale of carbon credits. As well as being a way to unlock funding from global business, carbon finance was also a new way of thinking, where companies are paid for results rather than through more traditional donations to a project based on its intentions. I believe that we can learn from this to measure the success of development project outcomes. 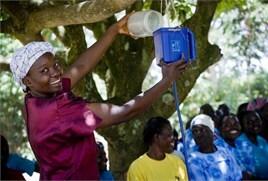 Through the award winning LifeStraw Carbon for Water project, our organisation is now exploring whether the same rigour developed for measuring carbon reductions can be applied to other development outcomes of projects, in this case health. Funded entirely by the private sector, this project is one of the first in the world to attempt to test the theory. The project distributed nearly 900,000 gravity fed water filters in rural Kenya, which means people no longer have to burn wood to boil and treat water. Each household is visited annually by staff from equipment supplier Vestergaard Frandsen, a company specialising in disease control products, which earns carbon credits it can then trade. Data on health and water treatment are recorded and geo-tagged through a smartphone app, and independently monitored as part of the voluntary Gold Standard, which only credits projects that actively promote sustainable development. Preliminary results from the first 18 months of operation show that the project is delivering safe water to 4.5 million people and is expected to cut two million tonnes of carbon dioxide a year (this is being verified by The Gold Standard). The odds of contracting diarrhoea and the likelihood of dehydration have decreased in children under five. Businesses, governments and NGOs are showing interest in a system where companies pay after specific targets have been measured, independently verified and delivered. LifeStraw Carbon for Water is demonstrating how results-based payments for development projects can work, and how the carbon credit model can serve as a template for evaluating development progress in the future. Edward Hanrahan is director of ClimateCare, an organisation that mobilises private finance to deliver projects with positive environmental and social impacts around the world. Previous articleStarAfrica Sounds: what if you were the new Star?